More ink pen scribbles. I’m using a set of Prismacolor pens, the finest point they make. (.005) Since the set only has eight pens, this is an obvious series using the same colors. 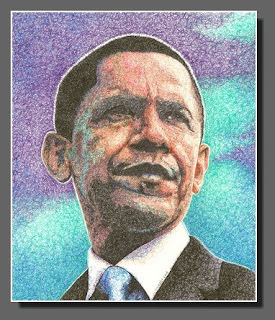 I’ve discovered there are sites out there dedicated to artwork of the President. Check out this popular one, ArtOfObama.com. They have added my work to their collection.